The new 10.5″ version of the Boogie Board is a nice follow-up to the original. We gave you a quick FirstLook of the unit last week, but thought a closer look was warranted. 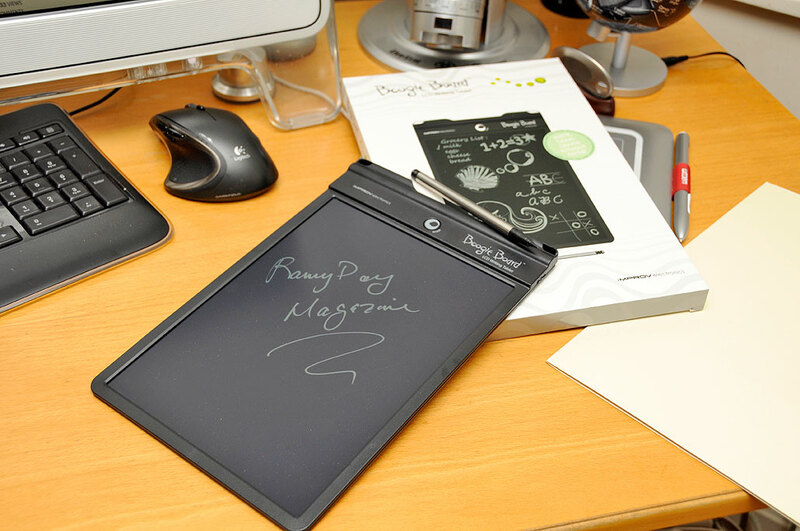 Boogie Board writing tablets are a tree-friendly alternative to the traditional memo pads, sticky notes, and dry erase boards. The new unit is 50% larger, has an integrated pen holder, and is powered by user-replaceable batteries. The designers maintained the Boogie Board’s thin profile by using AAAA (quad-A) batteries. They did a nice job of integrating the round bump into a handy grip. The new tablet also has a slider which will prevent the Erase button from clearing the screen. Those suggestions got our wheels turning about what we would like to see available for the Boogie Board. 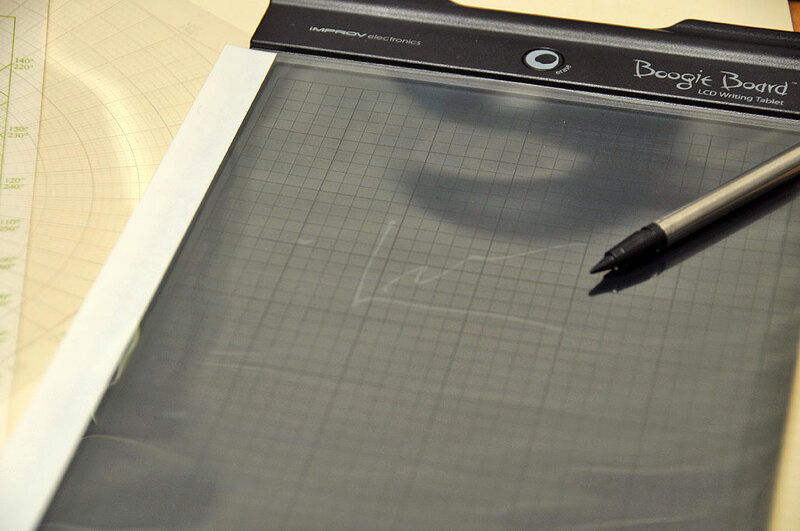 One quick idea is a hack we could easily do using a photo copier: print clear overlays to go on top of the tablet in order to make it easier and quicker to make accurate drawings. Grids were the obvious choice. Just so happens, we have a nice collection of different kinds of graphing paper handy. A quick trip to Staples and we had ourselves a set of clear acetate overlays. The next thing to try would be to print the patterns in white so the gridlines would show up better. Of course, it would be even cooler if we could push a button on the board to “activate” grid lines. Hint, hint 🙂 We have a few other hacks in mind and will post them if successful. Some of them will hopefully make use of our recent shipment of Sugru.